As of this writing, our winter storm system is rapidly pulling away from the Garden State. There are just a showers and sprinkles left in central and southern NJ (mainly rain). Indeed this storm dumped all snow over North Jersey and almost all rain over South Jersey. The timing forecast was almost perfect. However, my snow forecast ended up an inch or two too high for most. That's because only one or two of those impossible-to-pinpoint heavy snow bands set up Sunday evening. In that area around Warren, Morris, and Sussex counties, we saw upwards of 8 inches of snow accumulation. Right on target. Keep in mind, this was a heavy, wet snow. So shoveling might be extra tough. And we do have reports of a few power outages, as trees and lines struggle under the weight of such moisture-rich snow. Within just a few hours, we'll be basking in bright sunshine across New Jersey, with passing clouds throughout your Monday. High temperatures range from the upper 30s (where there is snow on the ground) to the lower 40s (where there is not). The sun and above-freezing temps will help kickstart the snowmelt today, especially on blacktop surfaces. During the daytime hours, you'll feel a stiff breeze at about 10 to 20 mph. As a weak cold front passes across the state Monday evening, you might catch a few flurries and a burst of wind. Gusts may top over 30 mph for a brief time. The rest of Monday night will be clear and very cold. Thermometers will sink to about the 20 degree mark, with a wind chill easily in the teens. Beware the refreeze — any remaining puddles will turn to solid ice by Tuesday morning. On balance, this first full week of March will be a bitterly cold one. Tuesday will be mostly sunny and still breezy, with high temperatures around the freezing mark, in the lower 30s. Wednesday looks to be the bottom of the barrel, with morning lows in the teens and highs only around 30 degrees. Our air and weather will remain dry, with a mix of sun and clouds. 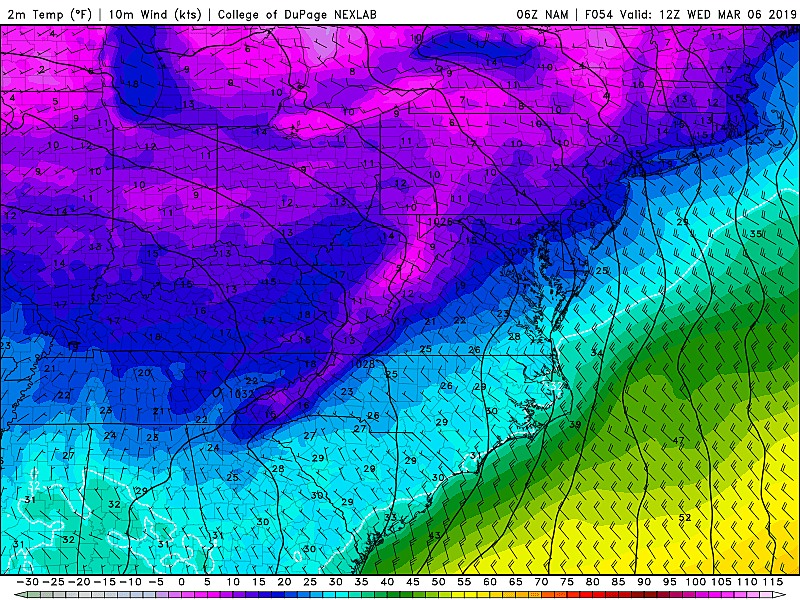 Much of NJ may remain stuck below-freezing for a third day in a row Thursday. Increasing clouds will accompany high temps again in the lower 30s. The next day to circle on your weather calendar is Friday. 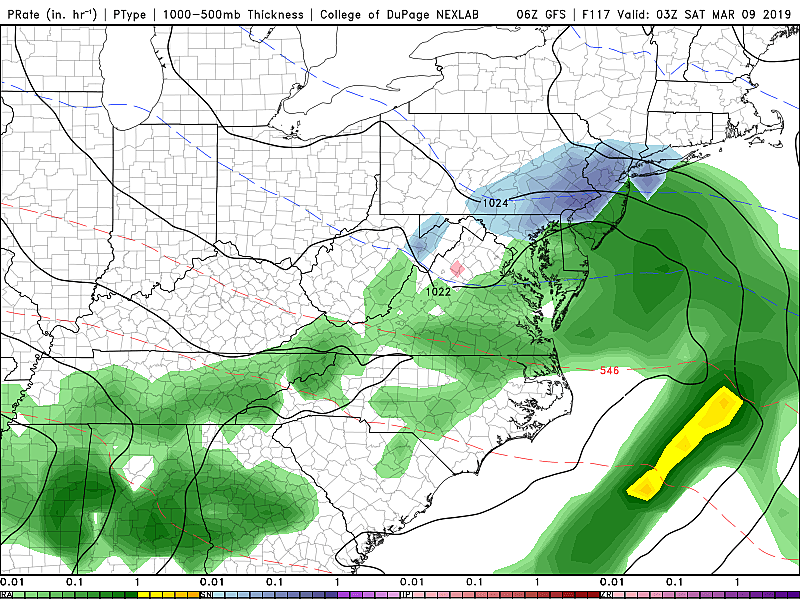 The GFS model shows a storm system producing a quick hit of snow, before transitioning to rain by Friday night. There could be a few inches of accumulation. However, it's worth noting that the Euro model shows this one will be a miss for New Jersey. Again, it's worth watching, but details at this distance are sketchy at best. Charging into the weekend, Saturday looks mostly cloudy as high temperatures return to seasonable levels in the upper 40s. Our next next storm system is scheduled for Sunday — with high temperatures firmly in the 50s, the most likely outcome of that one (for now) is just rain, rain, rain.